Tue., Sept. 13, 2016, 5:38 p.m. When three Spokane police officers pull up to the corner of a brick building, Michael Kurtz is facing the wall. About a minute later, two officers shot and killed Kurtz after he approached them holding a knife. 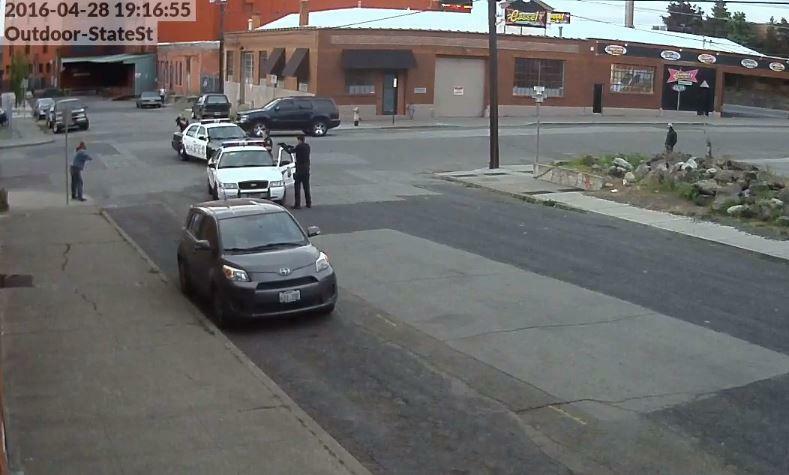 Spokane police on Tuesday released body camera and surveillance video from the fatal shooting April 28 outside the House of Charity, a shelter and drop-in center for homeless people. Spokane County Prosecutor Larry Haskell ruled the shooting justified in June. Kurtz, a homeless man, had been staying at the shelter before he was killed. Body camera video shows a tense interaction as LeQuire tries to get Kurtz to talk to him. Kurtz had called 911 saying he was suicidal, had a large knife and wasn’t afraid to harm police officers, police said Tuesday. After LeQuire tries again to get Kurtz to talk to him, Kurtz begins walking toward officers holding a knife to his chest and screaming, “Kill me! Kill me!” LeQuire fires his Taser, but Kurtz remains standing and continues walking. Soon after, officer Ryan Atkins and Brandon Lynch shoot Kurtz, then rush to grab a medic bag from the car to treat him. The video contradicts some witness accounts from after the shooting. One woman said Kurtz’s knife was on the ground and that he told police to leave him alone, though other witnesses said they saw Kurtz holding the knife and walking toward officers. The shooting led to confrontations with other House of Charity residents. One man, Arlo Morrow, began yelling and swearing at officers almost immediately after they shot Kurtz, saying, “Shoot me like you shot him!” Morrow was later arrested outside the House of Charity after he charged a police officer. A woman, Elena Olson, was arrested after standing in traffic and then assaulting officers who tried to get her to move, police said. The shooting also led to conversations about funding for services for homeless people and mental health. Spokane law enforcement director Jim McDevitt and Spokane County Sheriff Ozzie Knezovich called a news conference shortly after the shooting, calling it a tragedy that reflected the lack of mental health resources for people in need. Bishop Thomas Daly of the Spokane Diocese said the day after the shooting that had the shelter’s hours not been reduced because of funding cuts, Kurtz would have been inside and able to get the help he needed from trained staff. Days later, the city announced a commitment to funding the House of Charity as a 24-hour emergency shelter starting in 2017, a plan that had been under discussion before Kurtz was killed. Speaking at a news conference Tuesday, Major Crimes Lt. Steve Wohl reiterated that the shooting was tragic for everyone involved. “We respond to suicide calls on a regular basis … and many times we can get them the help they need,” Wohl said. Published: Sept. 13, 2016, 5:38 p.m.